NEW Purex® PowerShot™ Detergent is coming soon to a store near you! 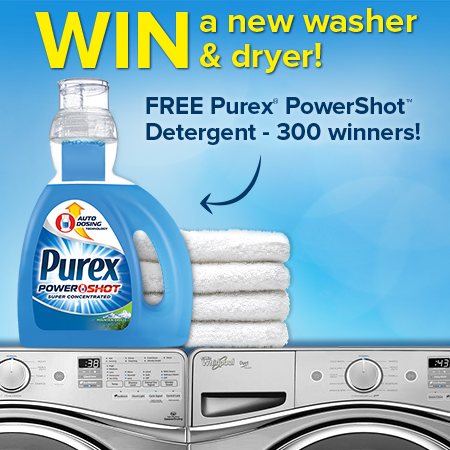 Purex® is holding an amazing giveaway in celebration of the release of NEW Purex® PowerShot™ Detergent! NEW Purex® PowerShot™ Detergent is a super-concentrated liquid detergent that does the measuring for you! The auto-dosing technology Purex has developed will ensure a no-mess, no-guesswork solution to your laundry washing needs. Watch this video to see how it does the measuring for you. After you watch the video, be sure to go here to enter the sweepstakes and receive your $1 OFF COUPON. What's Ahead for Blogging Through the Bible?